Why is it that in every science fiction movie, sooner or later the good guys always escape through the ventilation shaft? From Star Wars to Lilo & Stitch, whenever the bad guys are chasing somebody they go in theere. Need to get out of jail, go through the ventilation shaft, somebody about to shoot you, jump in the ventilation shaft. Why can't these "advanced" civilizations with their "lasers" either monitor inside the ventilation shaft or make them transparent for gods sake? Henchmen #1: Commander Zoltar (always need either a Z in the bad guy name or a 'ar' ending, if possible both) the prisoners have run away. Commander Zoltar: Check the ventilation shaft immediately! Any advertiser has to make sure that their message fits medium it travels on. See the picture below. It probably was a good idea to put the ad on the bus, but they forgot one little thing. 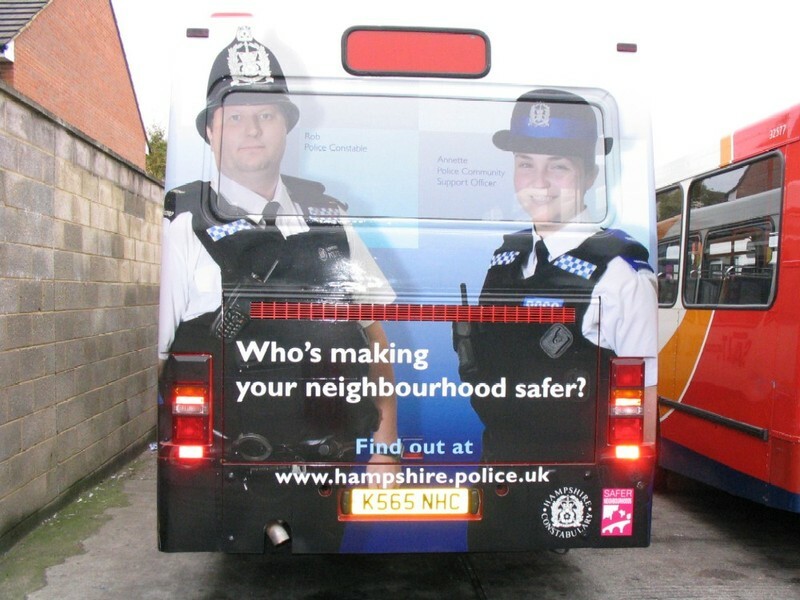 They forgot about the exhaust pipe of the bus relative to where the ad is. I have their annual report in my hand. Their Vice Presidents have some interesting titles indeed. Now those are bold titles...never seen that before. but they also have a matrix organization that has a different set of VPs. They have to work together. It's Friday night...let's have some fun. 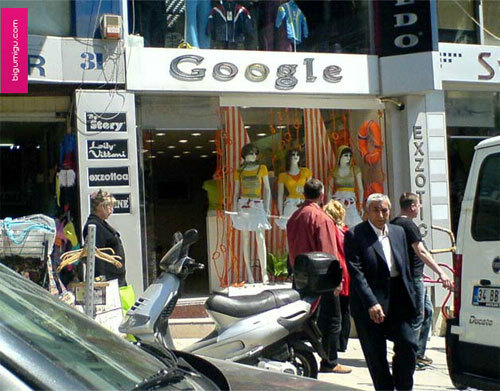 Google has entered the designer clothing business, and chosen Mevlanakapi, Istanbul as the location of its first store. Google aims to give the clothes away for free in return for contextual advertising on the clothing items. A spokesperson said, "It's a natural extension of our business model" and proceeded to give a well-placed Liverpool kiss to the photographer. After much anticipation I saw the movie. More of the same. Very funny, gets an A overall, but not as good as some of Borats shorter episodes. Comic genius yes. Did I expect more, yes. ...by the most talented comedian on the planet today. May we all be blessed with his wit and quick mind. Some computer games are phenomenal because they are immersive and they are multiplayer. The classic example, the one which started it all, is Doom. Some computer games are phenomenal because of their simplicity playing against a computer. The classic example, the one which started it all, is Tetris. This game is more like Tetris, it's beauty is in its simplicity. Thank you (or curse you) Cem for recommending it. 'The Sopranos' is a fantastic show. You can't help love these mobsters, because in between extortion and murder they show a level of wisdom and empathy rarely found in the most sophisticated environments. I am following the show a little behind, I am at episode 6-7, Tony wakes from his coma and is approached by a evangelist pasteur showing him the way of salvation. Tony is reading a book about dinosaurs when he enters his room. I paraphrase the conversation. Pasteur: "Scientists would have you believe that dinosaurs existed before humans. God created the world 6000 years ago and humans and dinsaurs lived together." Tony Soprano: "Like in the Flintstones?" Tony Soprano: "Yeah, but what about that carbon dating stuff and all"
Pasteur: "Tony, these people have an agenda." Christopher: "What's he sayin', there were dinosaurs back with Adam n' Eve?" Christopher: "No way. T-Rex in the garden of Eden, Adam and Eve would be runnin' all the time scared shi..less, but the book says its supposed to be paradise"
There you have it. This show is written brilliantly. The high definition vidoes on the world cup home page are phenomenal as well. Watch them here. Fans far away will follow the games as if they are there. Fantastic. I found out about this site, Egosurf, at Jeff Clavier's blog. Very cool. Put your name and blog and it gives you a ranking of "how hot you are" Kind of like hotornot for blogging, or "analytical vanity searches". One day a score like this will be up there in importance like SAT's and GREs. At this point I score 4043 on Google, 5774 on Yahoo, 2427 on MSN and 1783 on del.icio.us. Let's see what these numbers become by the time this blog becomes 1 year old. wiped? And who is being wiped? Why is my toilet paper printed on the inside? How do I fix this? line up? How do I fix this? which offers the identical answer. clue about addressing real people's needs. " Boudreaux, the smoothest talking Cajun in the Louisiana National Guard, got called up to active duty one day. Boudreaux's first assignment was to the military induction center, and because he was such a good talker they assigned him the duty of advising new recruits about government benefits, especially the GI insurance to which they were entitled. Before long, the Captain in charge of the induction center began noticing that Boudreaux was getting a 99% sign-up rate for the more expensive supplemental form of GI insurance. This was odd, because it would cost these low-income recruits $30.00 per month more for the higher coverage, compared to what the government was already providing at no charge. The Captain decided that he would not ask Boudreaux directly about his selling techniques, but would instead sit in the back of the room at the next briefing and observe Boudreaux's sales pitch. Boudreaux stood up before latest group of inductees and said, "If you has da normal GI insurans an' you goes to Iraq an' gets youself killed, da governmen' pays you beneficiary $20,000.00. If you takes out da supplemental insurans, which cost you only t'irty dollar a mons, den da governmen' gots to give you beneficiary $200,000.00!" "NOW," Boudreaux concluded, "which bunch you tink dey gonna send ta Iraq first?" I was driving by the ocean in Carmel this morning listening to a “nostalgia” CD I had burnt. It was all 1980’s music to remind me off my high school days. Among songs from Queen, Duran Duran and Nirvana was also Cyndi Lauper’s “Girls Just Wanna Have Fun”. I like Cyndi Lauper, but have always felt sorry for her. After all, in her peak she had to be in the shadow of another female artist, Madonna, whose star has burnt far brighter and far longer. Number 8 is my favorite by a long shot. them." The engineer said, "Why can't they play at night?" run a toxic waste pipeline through a recreational area?" talking frog, now that's cool. Bu sabah otobusten inmeden once boynumu kapamak, eldivenlerimi gecirmek, sapkami giymek gibi hazirliklarimi yapip burda kisin bile ender rastlanan soguklukta Piccadilly caddesine kendimi biraktim. Aslinda kendimi biraktim demek cok dogru degil zira bir metrodan cikinca guruh halindeki kalabaliga ve sehre kendini birakmak mumkun, ancak otobusten bir-iki kisi ayni anda inince ayni etki olmuyor. 2005 yilinin benim icin onemli degisimliklerinden biri olan metro yerine otobus ile ise gidip gelebilme luksu sayesinde sehre bambaska bir bakis acisi edinmis durumdayim. Aklimda da hep U2'nun sozleri: "it's cold outside, but brightly lit / skip the subway, let's go to the overground / get your head out of the mud baby." Sirketimdeki (nerdeyse) dokuz senelik is hayatimin her gunu sabah+aksam ise+eve metroyla gitmis+gelmis birisi olarak Londra'nin da yeniyuzyilin buyuk sehirleri etkileyen teror fenomeninden tube'umuzun vurulmasiyla payini almasi, 7/7 sabahi patlamadan biraz once Piccadilly line uzerindeki bir trenin icinde bulunmus olmamla birlikte beni cok etkiledi. Tam ofisim Green Park yakinlarina tasindiktan bir kac hafta sonra tube'un teror sonrasi kapali olusu beni otobuse alistirdi ve artik otobusun kolayligindan kolay vazgecemeyecegim. Hatta icinde su anda 8 adet video kamerasi olan 9 numarali modern otobusler bir yana Londra'nin artik tedavulden kalkan meshur Routemaster stilindeki otobusleriyle de bir kac ay ise gidip gelebilme keyfini yasayabilmis oldum. Ayakta durunca kafam tavanina degmesin diye 45 derecelik aciyla boynumu egmem gerekiyordu ama ama yuzyillik Routemaster'di iste, hic sikayet etmiyordum. Zaten boyle eski bir takim seyleri tecrube ederken modernligin alistirdigi rahat yerine eskinin verdigi huzur agir basabiliyor bazen. Mesela gecenlerde cikan yeni Asterix kitabini cikar cikmaz hemen aldim, hemen okudum. Ne yazik ki berbat bir hikaye. Ne espriler tam olmus, ne de gondermeler. Ama yine de eskiden bildigin ve cok sevdigin karakterlerle vakit gecirmek o kadar hosuma gitti ki. Gecen sene Yuzuncu Yil kutlamalarimizda seyrettigimiz Ruya Takim macimiz gibi. Hocic, Kubilay, Hagi, Cuneyt, Buyuk Metin, Tanju ayni anda sahada: futbolun yavasligini kim takar, otur divana, ac birani, seyreyle tarihi. Ki Hagi'nin o macta Simovic'e attigi saka-otesi golu de hala ara ara seyrederim. Topa oyle vurabilen biri daha gelecek mi acaba ulkemize? Ise gidip gelirken sehrin atardamarlarinda gecirdigim saatlerin herbirini turistik olmasa da sosyal ya da kulturel bir tecrube olarak dusunur, etrafimdaki karakterleri inceleyip ara ara kafamda hikayelerini yazardim. Mesela bu herif bu kizla niye kavga ediyor, veya bu cocuk annesinin kucaginda niye agliyor senaryolari. Tabii evlendigim tarih olan 21 Agustos 2004'ten beri bu etrafimdaki karakterlerin bayan olanlarini incelemem kimi yanlis anlasmalara sebebiyet vermis olup, Oya'ya neyin inceleme, neyin kesme oldugu arasindaki ince cizgiyi aciklamak zorunda kalmisligim vardir. Metroda ve otobuste turistler - bayildigim manzaralardir. Senede 28 milyon turistin geldigi Britanya'da Londra'ya ugramadan donenlerin sayisi azdir diye tahmin ediyorum. Londra'da da malum taksi fiyatlari ve muazzam isleyen metro+otobus sistemi varken haliyle akin akin insani sistemde gormek mumkun. Evim de ofisim de turistlerin sik gittikleri yerlerde olunca da benim gibi her sabah her aksam yapilan rutin seyahatler esnasinda hayatinda ilk defa Londra'ya gelen dort kisilik Connecticut'lu aile benzeri manzalarla karsilasmak komik oluyor. Metro bombalamalarinda olen insanlarin icinde de dokuz yildir her sabah metroya binenler oldugu gibi elinde metro haritasi ve boynunda kamerasiyla hayatinda ilk defa Londra'yi ziyaret edenler de vardi. Bu dusunceden urkmemek mumkun degil. Ve tabii 7/7 ve 9/11 sonrasi bu sehirlerdeki urkutucu hassasiyetleri gosteren gecen sene izledigimiz Crash ya da Yes gibi dramatik filmlerin cikmis olmasi da tesaduf degil. Turistlere donelim en iyisi. Londra'nin turistik klasikleri arasinda Buckingham Palace ve Big Ben'in yanisira bir de Portobello Road'da Cumartesi gunu sokak saticilarindan incik-boncuk alisveris tecrubesi vardir. Gecenlerde bu tecrubenin hep alici tarafinda yer almis birisi olarak Oya'dan bir Cumartesi masalarin obur tarafina gecme onerisi gelince tereddutsuz atladim. Planimiz Oya'nin mumlari ve baska bir arkadasimizin el yapimi fotograf albumleriyle masayi ve masraflari yari yariya paylasmak ve butun gunumuzu masa basina gecirerek hem Londra'mizla icice bir hayat tecrubesi yasamak, hem de biraz envanter azaltmakti. Dukkanlarda fiyatlarin %50 ile %75 arasi dehset indirimlerde oldugu durgunca bir Noel alisveris sezonu oncesi Londra'da buz gibi bir Cumartesi gunu tezgah acip musteri beklemenin ne kadar akil kari olacagini bizzat gorecektik. Cumartesi sabah 5 gibi kalktik. O gun zaten Londra'nin nazli topcularindan hernedense takim cikmadigi icin haftalik sabah macimiz iptaldi. Dort kisilik ekibimizle sabah ayazinda saat 6 gibi Notting Hill'deki organizasyon ofisindeydik (tabii bu isin daha onceden kaydolmak ve sigortalanmak falan gibi detaylari var, ilgilenelere anlatabiliriz). Ofisin kepenkleri acilirken etrafimizda duzinelerce her milletten insan sabah kurrasini beklemekteydiler. Her hafta duzenli gidenler en iyi masalari kapiyor, ara ara gidenler bir sonraki kalitedeki masalari kapiyor, bizim gibi ilk defa gidenler ise en kotu yerlere dusuyor. Saat 8 gibi benim hayatimda Portobello Road'da gitmedigim, sokagin ve masalarin en sonlarinda bir yerde masamizin yeri belirlendi. Herhalde mallari getirisimiz ve ilk kahveleri alisimiz saat 9 gibiydi. Masamizi kiralayip kurarken etrafimizdaki esnafla guzel sohbetlerimiz oldu, dayanisma ornekleri yasandi, neye ihtiyacimiz varsa tecrubeli abi-ablalarimizdan kolayca tedarik etmemiz mumkun oldu. Bir ara siftah kelimesinin Ingilizcesini dusunduk dusunduk, cikaramadik, ama siftahimiz icin cok heyecanliydik. Saat 10 gibi de tezgahimizi acip beklemeye gecmistik. 8. Ve son olarak da - acik arayla en zor adim olan - elini cebine sokup cuzdanindaki parayi sana vermesi gerekiyor. Masamizi kurusumuzdan sonraki dort saat boyunca (yani uyanisimizdan dokuz saat sonra oluyor) yukaridaki sekiz unsur ayni anda gerceklesmedigi icin masamizdan bir tane bile satis yapmadik. Gelip de urunlere bakan insan sayisi bile cok azdi. Yerimizin uzakligindan mi, havanin soguklugundan mi tam bilemiyorduk ama sonucta uzerimize korkunc bir karamsarlik coktu. Hemen sagimizdaki tezgahtaki iki metrelik siyah sacini kafasindaki beyaz turbana dapdar bir sekilde sarmasindan midir nedir kafasini hic oynatmadan konusan Hintli arkadas bile Hindistan'dan gelmis muazzam rengarenk giyim-kusam urunlerinden bir tane bile satmadi. Ki biz biraz olsun tecrube ve eglencesine ordaydik, oysa kendisi hayatini bu urunleri satarak kazaniyordu diye tahmin ediyorum. Arada dialoga girdigimiz potansiyel musteriler olmadi degil tabii ki. Ancak yukardaki unsurlarin ilk besini basariyla gecmis ender musterilerin masamiza ugradigi anlarda bizim gruptaki 4-5 kisi birden uzerlerine ac kurtlar gibi yuklenince kendilerini intimide ettik ve unsurlarin altincisindan sektik. Veya mesela amacsizca yuruyen kolkola girmis mesut bir cift dusunun. Kiz aaa bak ne guzel mumlar diye masamiza yaklasiyor. Erkegin suratinda niye duruyoruz yaa? der gibi bir ifade. Kiz kokluyor, elliyor, fiyat soruyor. Erkek cep telefonuna bakiyor, sagi-solu seyrediyor, olayla alakasiz. Kiz mallardan birini ve fiyatini begeniyor, erkege soruyor alalim mi? diye. Erkek dudagini bukerek bosver yaa napicaz mumu simdi yayinti falan gibisinden bir yorum yapiyor. Kiz e peki madem diyip vazgeciyor. Kolkola uzaklasiyorlar. Isin en acikli yani masanin ote tarafindayken Oya'yla cok sik icinde bulundugumuz bir durum bu! O zaman birak yaaa deyip gitmek kolay. Ama su zaman masanin beri tarafinda disimdan peki iyi gunler derken icimden bu elemanin yillar once dogumuna yardimci olmus bir hastane gorevlisini aniyorum. Artik musterilerle "su elimde gormus oldugunuz mum el yapimi Osmanli cami minaresi motiflerinin otesinde 200 saat yanar ve hayat boyu salonunuzun onemli bir dekorasyonu olur" tipinde bir dialogdan enerjimizi kaybederek Gora'daki Cem Yilmaz misali "neticede mum iste yani neresinden bakarsan bak" tipinde bir dialoga gectigimiz anlarda, tam moraller dibe vurmusken, ve her havuzun dibi ayniyken, inanilmaz bir sey oldu: album satan arkadaslarimizdan biri sabrinin da tukenmesiyle konustugu bir musteriye sabahtan beri soyledigi fiyatin yarisini soyleyerek satis yapti! Ogledensonrayla birlikte daha da kalabaliklasan Portobello Road'daki masamiza da bir anda inanilmaz bir momentum gelmisti. Ilk mumumuzu sattigimiz, fiyatta anlastiktan sonra ben tam torbaya koyarken fiyati Â£2 daha indirmeye calisan, ve sonunda yine de tam fiyattan alan Alman cifti Herrhausendiebeinder ile Frau Hausendiebeinder'i kolay kolay unutmayiz heralde. Artan satislarimiz ve yavas yavas ziyarete gelen arkadaslarimizla birlikte musteri dialogu konusunda da kendimizi asmaya baslamistik. Kapalicarsi ortamini iyi bilen insanlar olarak turistlerle kendi dilleri olan Ispanyolca, Italyanca, Yunanca, Portekizce, Fransizca, Rusca konusup, alanla da almayanla da nese icinde muhabbetlere girmeye baslamistik. Turistler tabii ki eglenceli oluyorlar ama Londrali cok enteresan tiplerle de karsilastik. Mesela bir elinde doner durum tutup diger eliyle Â£5'lik mumlardan birini alan gunes gozluklu sakalli arkadasin o mumu ne yaptigini merak ediyorum. Ayrica nereli oldugunu sordugumuzda bize gobekbaginin Jamaika'da kesilmis olmasina ragmen kendisini Dunyali olarak anan esrarli zenci arkadasa da selamlar olsun. Bu arada tabii ki bize gun boyu gidip gelerek hem moralman hem de satin alislariyla destek olan tum dostlarimiza da sevgiler. Son olarak da ogledensonra beliren koyu gri bulutlarin arasindan yagmur yagmasini eger gercekten herhangi bir guc bizler icin onlediyse, ona da sonsuz tesekkurler. Sonucta uyanisimizdan takribi 12 saat sonra artik havanin hafiften kararmaya baslamasi ve gelen-gidenin de azalmasiyla masamizi toplamaya basladik. Envanterimizin cogu aynen duruyordu ama masamizin toplam satislariyla gunu az da olsa karda kapatmis oldugumuz icin gururluyduk. Yanimizdaki Hintli iki metre sacli arkadas kocaman tezgahini yine kafasini hic oynatmadan nasilsa toplamayi becermis ve vasat satislarina ragmen vedalasirken nesesini kacirmamisti. Bundan sonra herhangi bir sokak pazarinda mal satan insanlara hepimiz bambaska gozlerle bakacagiz. Birbirimizle ve Londra'yla cok ozel bir Cumartesi gecirmis olmanin verdigi mahmurlukla evlerimizin yolunu tuttuk. Bizim pestilimiz cikmisti ama Londra, caddeleri, metrolari, otobusleri, ve yuzlerce degisik ulkede gobekbagi kesilmis akin akin muazzam rengarenk insanlariyla Cumartesi gecesine hazirlanmaktaydi. Neticede Londra iste yani neresinden bakarsan bak. Why do I like this store so much? They don't really have good quality stuff. But they are cheap to the point of being disposable that I like a lot. It's the only place where I find clothes that are "too big for me". Everywhere else it's a pain to find stuff that fits me. There I try a pair of pants and they are "too big". Does that make you feel good or what? This kind of customer satisfaction, and customer loyalty can't be bought. 4400 hunters killed more than 50 Insurgent bears in New Jersey (and 75 more were heavily wounded and the remaing bears were told to surrender). The full news is below, but this quote of a proponent of the killing is very telling indeed. "No matter where they eat, they're still going to reproduce," said Andy Romanelli, 36. "The facts are the facts. They're overpopulated." It's not where they eat, but what they eat. If they can't to the bearproof trashcan, maybe just maybe the food supply would control the population. One other proponent said: "If the bear had a chance he'd do the same to you and everybody you care for!" Read the news for yourself. More Than 50 Black Bears Killed in N.J.
VERNON, N.J. - As opponents turned out to denounce them, hunters killed more than 50 bears Monday at the start of a state-authorized hunt aimed at thinning New Jersey's burgeoning bear population. The hunt, restricted to the state's northwestern corner and open to about 4,400 hunters with permits, got under way in freezing weather after legal challenges by animal rights groups failed. "Bears are beautiful animals, but they've got to be controlled," said Joe Giunta, 59, who bagged one Monday morning. "Today, for us, is a very sad day," said Lynda Smith, president of Bear Education and Resource Group, one of two groups that unsuccessfully sued to delay the hunt. "They're here to kill them, we're here to help them." "It's an emotional issue," said Martin McHugh, director of the state Division of Fish and Wildlife, which estimates the bear population at between 1,600 and 3,200. The state's last bear hunt was in 2003, when 328 were killed. That was the first since 1970, when hunts were suspended because the black bear population had dropped to about 100. What I am about to tell you is all true except for places where I have embellished. Tonight, or about 2 hours ago began my first trick or treat experience in America. To be completely truthful it was the second trick or treat. The first one was when my parents were in the U.S. for two years between 1977 and 1978. I was 5 years old then and the only thing I remember is that I was “Casper the Friendly Ghost”. I also remember sticking my head in a bucket with apples in it. Years later I found out that that was called ‘bobbing for apples.’ Well they don’t bob for apples anymore and Casper, friendly as he may have been is now replaced by power rangers and Arachnaman, or was it Spiderman, I don’t remember. Anyway, this was the first trick or treat with our twins Sofia and Lara. Our nanny Danielle was with us, and so was my brother, Yalin visiting from London. The week before I had promptly bought a bag of candy thinking that this little bag would be more than enough for the entire evening. I thought about 4-5 groups of kids would visit. Little did I realize what was to happen. So here is the cash flow analogy. Imagine we are running a business and the candy I have at home is cash. When kids come I give out cash and when my daughters collect we receive cash. Those are my payables and receivables. In the end our product is, shall we say, “a happy Halloween.” The more kids come, the happier they leave because they get candy, and that’s the business we are in. It started very well. The business plan was simple. My wife Susana, my brother, our nanny and the twins would go out in the neighborhood collecting and I would stay home to give the candy and join them occasionally. Lesson 1) Simple in theory doesn’t mean simple in practice. So it took a while before Sofia and Lara, our sales force, was convinced to wear the chicken outfits that we made for them. Their sales training took longer than expected. Lesson 2) A sales force takes longer than expected to become profitable. In the meantime our doorbell kept ringing and I began to give out candy. Still grossly underestimating demand, I was hanging out Butterfingers and Hershey’s kisses faster than free food disappearing in a company kitchen. I wasn’t giving one piece of candy to each ghoul either; they were getting them in two’s and threes. Lesson number 3) It is easy to spend cash when you have lots of it. So the evening continued. Slowly I noticed that our cash (candy) supplies began to run low. My sales force was knocking on doors left and right, but the candy they collected was in their cute little buckets. They were booking orders but I wasn’t realizing them until somehow they were brought back to our home. Lesson 4) Bookings don’t generate cash until you collect. Enter my brother Yalin, who was dressed as a Jedi Knight. I gave him the orders to bring the candy from Sofia and Lara’s bucket back to our house. In a way he became my collection agent. During the night he kept bringing back the candy Sofia and Lara collected and I kept giving the same candy out. This worked just fine and I started accumulating cash. We were collecting faster than we were paying. Lesson 5) Days receivable < Days Payable generates cash. Thank God for Michael Dell. Well there was a problem growing here. Now that we were rolling in cash, the CEO of this whole scheme, myself, engaged in funneling cash into his pocket. In this case, into my belly, because I was giving out black licorice candy and eating the Nestle Crunch Bars. Lesson 6) When things are going well, management gets fat! And then the troubled times hit. Since Sofia and Lara were so cutely dressed as chicken they started spending more and more time at every house. This affected our cash position. While our neighbors/customers were asking intelligent questions like “are they twins?” and saying how cute they were, my brother was qoting Star Wars saying “May the Force be with you” and “Hello young Padawan!” If only he looked in the eye of our neighbors and waving his hand said “you will give me all your candy now” we’d have no problems. But that didn’t happen. Our sales force started to drag their feet. Our sales cycle got longer! Lesson 7) Sooner or later the sales cycle gets longer, keep your sales force properly motivated. By this time my sales force was expanding internationally wondering into the side streets and I no longer had control over them. What’s worse the demand kept growing. Mermaids started showing up at my doorstep in schools, and superheroes, witches, teddy bears and ghosts snuck up on me from every direction. I was scared. Halloween had really begun. Soon enough I ran out of candy and in desperation started giving out donuts from the Entenmann’s pack Yalin had bought earlier. Later I was told that giving donuts is a big no no around here. The candy has to be wrapped. There is a parent out there who may just be discovering crushed donuts in their son/daughters loot. Sorry. Oh well, the neighborhood goblins took the donuts nonetheless. Lesson 8) When in desperation a company will sell anything including damaged goods in order to make money. It was time for a reorganization in this company. My brother the Jedi master was now relegated to a quota carrying sales guy. He also got candy for every ring. 20 month old twins and a 26 year old Jedi were my salesforce now and the Jedi was using The Force and meeting his quota. Lesson 9) When survival is at stake everybody sells. However, even that was not enough. Our payables exceeded our receivables so much that I ran out of even the donuts. I was going to offer them rice and meatballs but even a desperate CEO must not cross every line. So I turned off the lights in our business, which means that our house wasn’t participating in Halloween and I joined my now bankrupt Halloween crew. It was wonderful walking around the neighborhood and meeting the people that in the usual hustle of the week I never make the effort to get to know. Everybody was friendly. Everybody was smiling. Despite the troubled times we were in, there was magic around and that magic was the sense of community. While I was two continents and an ocean away from my homeland I found a similar sense of security and friendship. So here is the final lesson. Lesson 10) No matter how difficult things may get, no matter how far away you may be from your comfort zone, when you make the effort there are always friends around. Tonight was the celebration of the human spirit and I am very happy that my first Halloween in the U.S. ended in such a good note. Next year, I am decorating my house. Recently I got a package in the mail from Safeway, the local supermarket. It was the first time I got a package from them, I opened it, hoping it was cash, but it wasn't. It was the Schick Quattro, the new razor. They wanted me to try it. Shaving is a curse for men, but it is a worse curse if you don't need to shave. Nonetheless, the experience requires you to cut the top layer of your skin, taking with it growing hair. Early in history this was nontrivial, you had to carefully put the razor blade in the razor, screw the top and very carefully shave. Or if you used the hand blade, boy you could cut off your ear if you're not careful. It got easier over time, you got the disposables and then the Gillette razor. It was a big deal then. Few years later, the Gillete Sensor showed up with the double blade. Boy that was innovation. The first blade cuts the hair and the second blade cuts the little piece that's pulled by the first blade thereby giving you a closer shave that women find irresistable. I stopped right there. I still use the Gillette Sensor (Excel now) and it does the job. I get very happy when next gen stuff comes out because that will mean cheaper shaving for me most likely. Anyway then the Mach3 came out. Everybody had to have one, I have one too, but only use it rarely, I think it's in my travel bag. OK, so what's the story here? Three is greater than two, so does it really mean it is a better shave? I think it's pushing it. What really happens there? What the first blade AND the second blade misses, the third gets? Makes it sound like ten years ago people didn't know how to shave, and looked like they have a 5 o'clock shadow at 7:00 am? I don't think so. But they sold well, hats off to Gillete. Then they came up with the battery powered one which I thought was real genius going after the electric razor crowd. Gillette gets an A. Enter Schick. What do they come up with? What strategic product management meeting resulted in the brilliant idea that said, "Hey lets come up with four blades? That's surely going to be better. If they bought three, they'll buy four. " Sounded a lot like that movie where one guy decides to make the video, "7 minute abs" which would blow away "8 minute abs" right out of business. Why cut my skin with 4 blades when 2 does the job? Think of the irritation on your skin. If you are 30 years old today, with 4 blades vs 2, in 20 years, you'll be 50 but with skin as tarnished as a 70 year old. Did Schick do long term studies on the four blades? I highly doubt that. So that is the first marketing mistake. I heard Gillete will come up with 5. I sincerely hope they don't. Because then the geniuses at Shick will come up with six. The first blade cuts the hair, the second cuts it a little more, the third finishes off the root and takes part of your skin, the fourth eats into your epithelial tissue, the fifth takes care of your sweat glands forever and the sixth gently numbs the nerves so you don't feel pain inflicted by the first five... But what makes it even worse is the name. Hmm, my product has four blades, so let's call it: Quattro! This is just brilliant. I heard Schick paid $4M dollars to a branding agency to come up with the name. So, so creative. I would never have thought about it. Never done before, great job. I want all of you who use the four blades to imagine an ad, where a graphics animation is shown of 4 blades going over 1 piece of hair. One, then another, then another, then another in slow motion? Would you still use it after picturing that in your heads? Poor little hair, taking all that abuse... So there you have it. To fight Gillete they decided to put four blades and call it Quattro. I bet it will be a failure.